The TE series consist of a stainless-steel cannula with a double helix polypropylene hub. 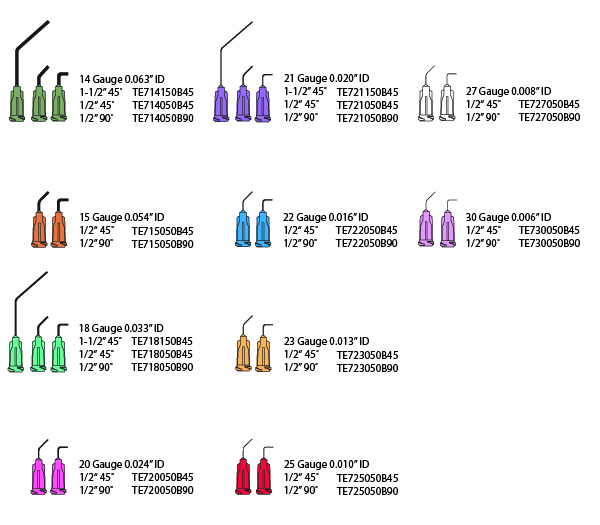 This premium line of dispensing tips is burr-free, and has an electro-polished cannula for unobstructed and consistent material flow. In addition, they are silicone and chloride free. These TE bent tips are precision bent at 45º and 90º angles. Perfect for dispensing fluid in hard to reach places.